I am so excited, and for several different reasons! First, and foremost, I know and appreciate the quality that each Graceful Embroidery element offers. Secondly, I realized the potential of combining the letters to personalize many wonderful gifts such as bath towels, pillow cases or even tote bags with a monogram. 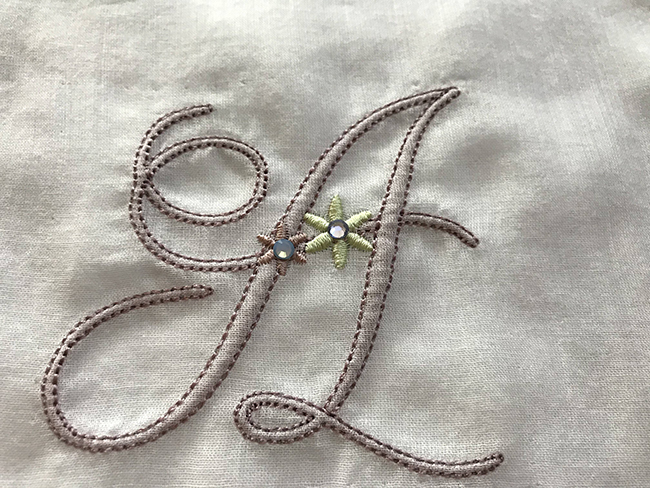 Add to the fun, the ability of accenting a letter layout with other Graceful Embroidery designs such as an element from the Georgiana collection. However, this alphabet can also be combined with letters available in software programs or even those built into many embroidery machines. 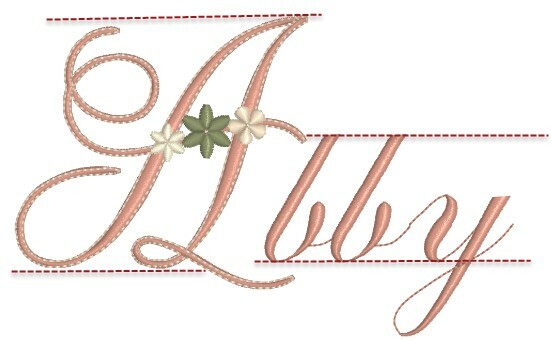 Using Premier+ Embroidery Extra’s Lettering tab, Script Lettering/Adina 25-100mm was chosen to complete the desired name, adding “bby” as a single element to the Graceful Alphabet letter “A”. After changing colors to match, this is a wonderful name display either left in a straight line or using one of the many built-in line type shapes. Creativity can be taken to a different level when each letter is individually brought into the mix. We now have an environment in which individual letters can be rotated to produce unique spacial dimensions. 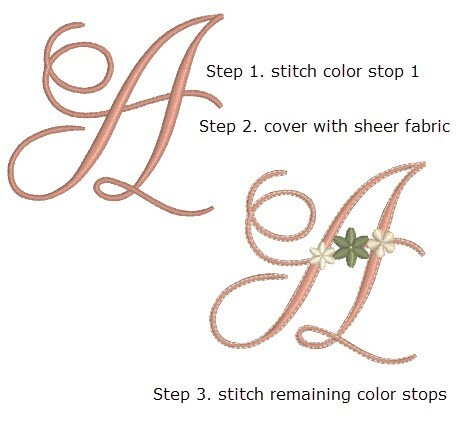 Designs by Graceful Embroidery often include many color stops which afford creative options. Suggested colors can always be changed to suit individual style. Once it is understood what each color represents, there is freedom to skip a color stop or separate elements in an editing program: omit a flower by skipping over a color stop or change a floral position in the editing program. 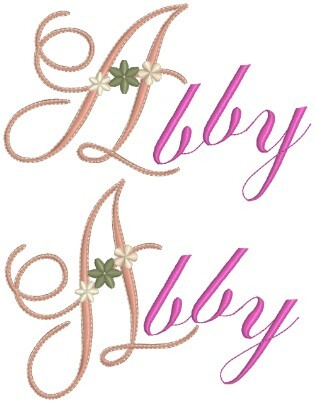 Because this design features a satin fill which stitches prior to its outline, this alphabet can be stitched in a shadow-work effect by first stitching Color 1 directly on a quality fabric-like stabilizer (Sulky® Soft ’n Sheer™ Stabilizer is recommended) or on a white or pastel colored piece of cotton. That foundation piece is then covered with a very light-weight fabric such as cotton gauze or muslin stitching out the rest of the design. 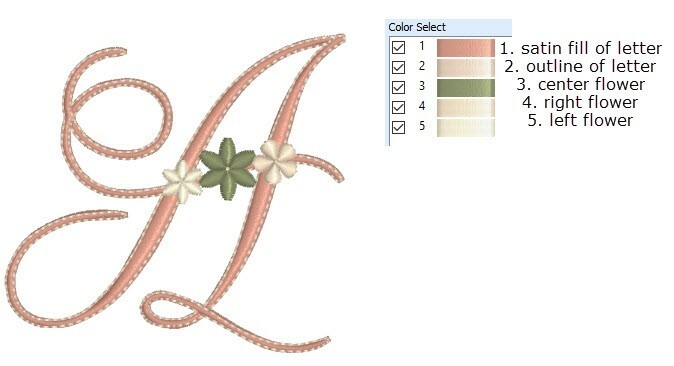 The letter will now present with a hint of colored fill with the outline and flowers being most dominant. 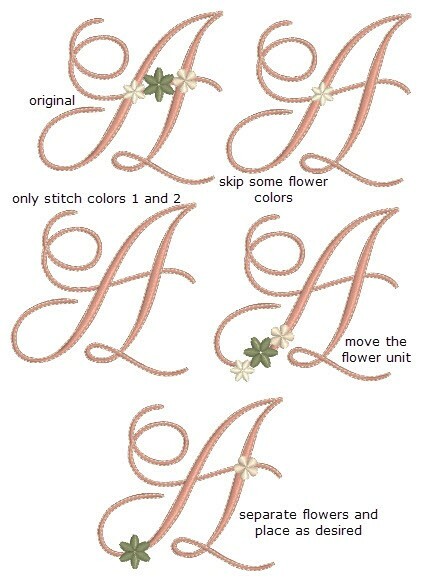 Enjoy this wonderful alphabet and share your inspirations with Graceful Embroidery. To discover the many ways shadow-work can be imitated with machine embroidery, please read “Creative Machine Embroidery” May/June 2018, a bi-monthly magazine available as a printed subscription, an on-line subscription or in local sewing stores. It is often found on newsstands or bookstores as well. Pamela’s yearly theme for 2018’s column is dedicated to “how traditional heirloom techniques can be applied through machine embroidery”. 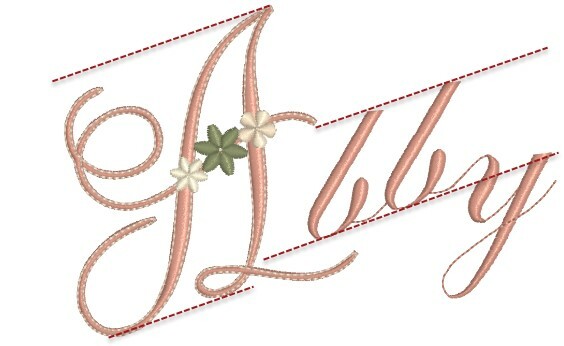 I love it when Pamela does a blog and I wanted you all to have the opportunity to read it again especially as I release the Grace font for sale today as part of the selection of great designs being released for the update of my website. 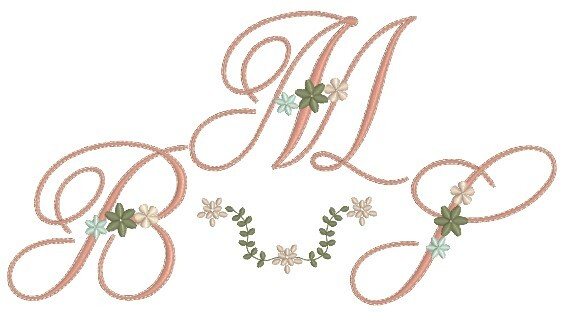 This entry was posted in Announcements, Embroidery projects, New Designs and tagged combining embroidery designs, development of embroidery, heirloom embroidery, shadow work. Bookmark the permalink. Thank you for all the great information, ideas, tips!! Truly beautiful alphabet!!!! Thank you for these easy to follow step by step instructions accompanied by photos. Truly beautiful! oops, forgot to thank Pamela for her detailed description of how to make so many lovely variations of the Grace font.